Begins with a clear vision – what will your home look like? We understand the challenge of envisioning something that doesn’t exist yet. That’s why we designed a guide for homeowners. Use it to solidify your vision of your future home. 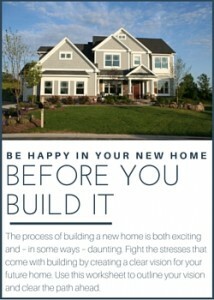 Fill out this form and we'll send you our free guide on how to be happy in your new home before you even start building it! Once your home is built, we have a system to monitor the performance and warranty of your new home. It is important to protect your new home as an investment. We are still available for you while your home is new. Walking through the home together before move-in and after 6- and 12-months ensures you are comfortable and happy. A New Home Orientation to learn the mechanical features of your new home. “Punchlists” after each walk-through for items that need attention. Information on your Warranty program. Contact information for any possible issues with your new home. This concludes the overview of our New Home Experience, your guide through the home building process. Ready to get started? The first step is a free consultation. During construction, our goal is to ensure that you feel confident and satisfied that you are informed on the progress made on your home. 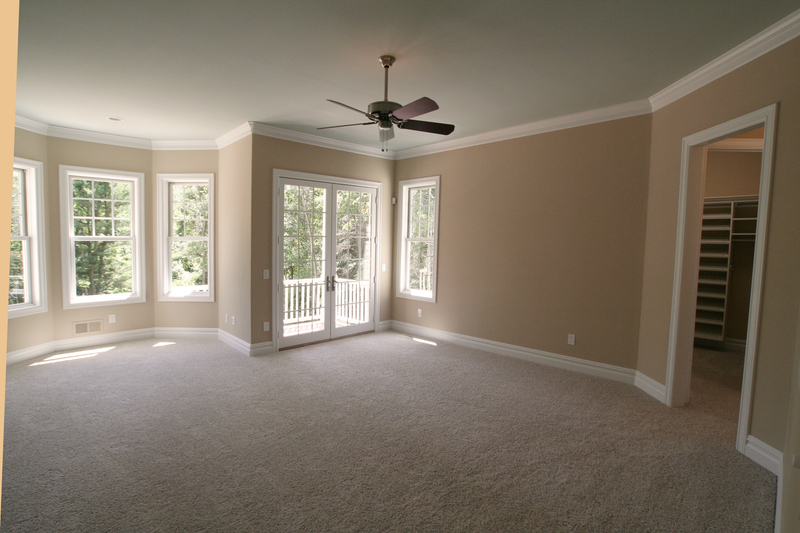 This is the part where we take care of logistics and coordination of all the details to build your custom home. Construction has begun and you will continue to make important design decisions. Throughout construction, you will have the Building Game Plan™ to keep you informed of the progress made on your new home. This is a big-picture view of the construction schedule so you know what is generally happening at the site. You can take comfort in the knowledge that we have a schedule and a plan to overcome any challenges. In this step of the building process, design decisions are a stepping stone from blueprints to beginning construction. You will make critical decisions about how your home will look, which is challenging yet exciting, with the assistance of a Designer. The many design opportunities available in a new home can be overwhelming. Our design workbook leads you through the selections that need to be made, in the order that they are built. Making these decisions in the right order will keep your build running to schedule and ensure a cohesive look throughout your home. A designer who is familiar with our building process. Selection sheets to guide you through the decision-making process. Drawings of your home for reference. Now that you’ve identified your lifestyle, design possibilities and outlined how those fit in with your budget, we’ll get down to the bottom line. In this meeting, you will learn the detailed pricing of your new home, discuss any options to modify the cost and sign your contract. Pricing. Including the building structure, design and any add-ons. Design Options Pricing. These are elements that can dramatically increase or decrease the overall price of your home, and can be modified to keep your budget in check. We are happy to make recommendations for you. Contract. Your official contract for your new home. Transition Solutions. Information on temporary or long-term housing while you await your new home. What is a picture-perfect moment in your future home? Maybe you have more space for entertaining, rooms for children or grandchildren, a large gourmet kitchen or a luxurious backyard. Maybe you have all of these and more. Taking a look at how you’d like to live in your future home while staying on budget is the third step of our process. The goal in this step is to understand your lifestyle and what that means for your custom home, while also maintaining the established budget. We want to help eliminate any fears you may have with making decisions that won’t fit in with your home, style or budget. Knowing the possibilities gives you the freedom to create the home of your dreams and stay within your budget. Once you have decided to build with us after our complimentary meeting, the education process begins. You will learn the information necessary to make informed decisions with confidence, and you will have us at your service for any questions. Learning all the components of the home structure. Learning all the areas of the home where you have design possibilities. 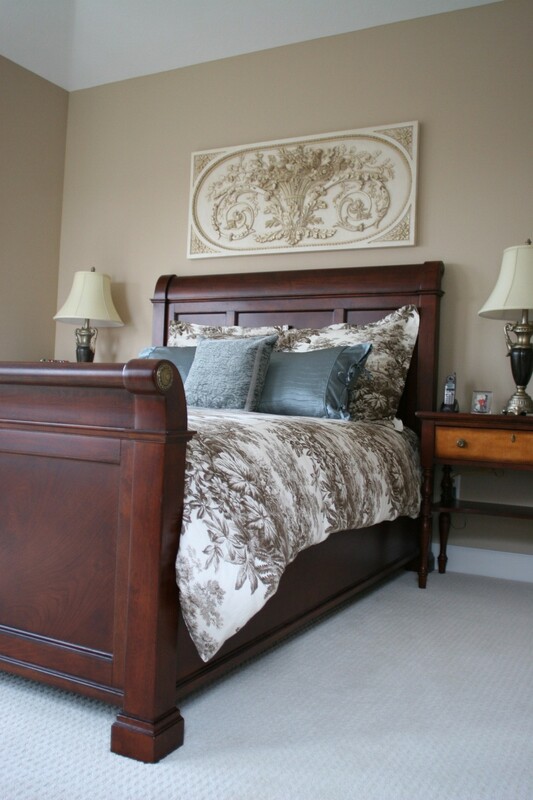 Understanding the design of each detail in your custom home. The first step of our New Home Experience is a complimentary meeting where we get a feel for working together. We’ll review your concerns, possibilities and strengths. Your vision for your new home. Your lifestyle and how it fits into home design. Your budget, and how we will protect your budget. Your top priorities for your home. The organization of the building process. Sign up for monthly updates with insights into our business philosophy and building process.